Okay, so I still live in the dark ages of laundry in relation to today's society who either dry-cleans everything or worships their dryers. And, while I have a dryer, I don't like to use it other than for socks and underwear unless I'm forced to. But my complaint isn't about my beloved clothesline, hubby knew that way back when and after the initial 'store-bought' posts sagged and failed years back, hubby put up double 12 x 8's on each end with another 12 x 8 crossbar…embedded 4 feet down in cement, no wind was going to take this 4 line clothesline anywhere. And it hasn't—yet at least, through blizzard to hurricane, the clothesline has held up well. My gripe is over my clothespin bag. Years back, they actually used to make good clothespin bags. I wish I had a picture of them to show you, but alas, none are available. Over the last few years, what is offered is for those who make pretend at hanging their clothes out on days when there is no wind, hell, there can't be a breeze or these things will fling off the line like they've been shot-putted to land in the mud or dirt. The bags tear easily and break, and destroy the pins inside. 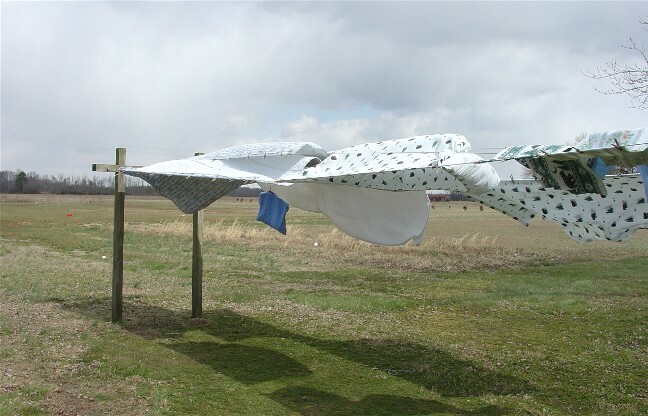 It has been a mild, but WINDY winter this year and when I've been able to hang clothes out, the bags keep being tossed off the lines—even when I've pinned clothespins to them. In October, I had about 200 good clothespins and two brand new bands, courtesy of WalMart. These bags with their little hooks couldn't retain their grip—at all. It's February and they are full of holes and covered with dirt smudges. I've suffered a loss of at least a 1/3 of my good pins to breakage. Yesterday promised to be a good drying day for a Saturday. I had an entire week's worth of winter wear in dire need of washing and drying, lots of jeans, sweatshirts, and work wear. The undies would take the dryer. The clothes needed to be done and Sunday would be saved for all the bed linens and blankets—the weather was deemed clear, cold, and very windy. Immediately, the pin bags dropped to the ground, the winds were running a steady 15 mph, nothing too abnormal for this time of year. But the winds would grow stronger throughout the day. I could either keep hanging them back up and watch them keep dropping, much like a picking up a tot's toys flung from their walker and they scream to have them back before throwing them back on the floor. Frustration! Well, frustration leads to either madness or inspiration. Being the internet maven I am, I was thinking I'd find the answer via Google. Google answers all questions for me…even of the Sophomore homework kind, praise the internet and sally forth! Yet, when I did my search, it came up with the very same two types of clothespin bags—that do NOT work. They just don't. Okay, they are cheap and I could just resolve to either continue to pick up my pins from the ground or just keep them clipped onto the clothesline as some do. I've never been of that variety and am too old to start now. But there was this ONE link…make your own clothespin bag kind of thing. You know I clicked on it. All I needed was the concept. And while the pattern was provided, I didn't need it. A wire hanger and a hand towel—didn't even need the visual, I could work it out from there. The key for me was the wire hanger, it can be hooked in such a way it CANNOT be flung from the line. Thus I took a wire hanger, one hand towel, and some yarn (no twine or thread for me, thank you), because YARN, that good old-fashioned stuff will last longer than the towel itself. It was a rushed, fifteen minute affair of stitching up the sides of the towel, haphazardly and cutting an opening in the selvage of the top of the hand towel and stitching that in to prevent fraying. Then I simply inserted the wire hanger and bent the arms a bit. Voila! A new clothespin bag was created and one that will hold all of the remaining pins. It went out on the line yesterday and held up well. 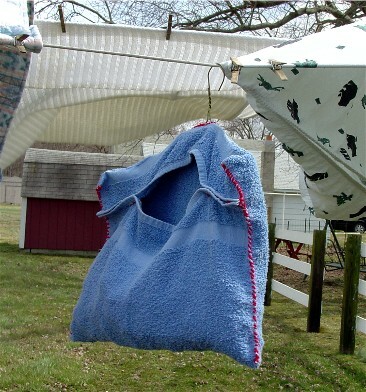 Even today, with the winds gusting to over 35 mph for the bed linens (and it was a trial to keep them pinned to the lines), the bag never left the line. It remained where I put it, ugly as it is; it is functional. It's cost? The amount of the hand towel, nothing for the wire hanger, the yarn amount negligible, and fifteen minutes of my time. The pride I feel over making such a small, goofy thing that actually works? Priceless! So, the next time you think that your "fix" has to come from a store, stop and think. You might just solve your own problems sans a purchase with a bit of ingenuity. It will bring you a great bit of small joy. Sometimes our small joys can be quite rewarding.